Able to hold two barrels at a time, the Apprentice™ Pen Mandrel is an affordable pen mandrel that’s precision machined for accuracy and is guaranteed to run true. The compression fitting acts as an adjustable "stop" adds versatility by allowing you to mount single or odd size barrels. 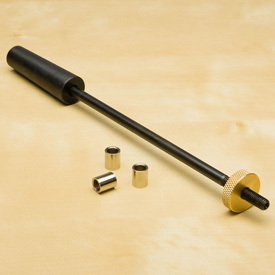 Made for Craft Supplies USA, this mandrel is not guaranteed to accept bushings from other brands of pen mandrels. Comments On Sep 09, 2018:I use this to make wooden rings, and cant think of a way to improve it. Love it. Comments On Jan 03, 2018:Love it. Have been using it to turn rings. Comments On Dec 17, 2017:This pen mandrel is good quality and works just like it should. I've turned a ton of pens and rings with it. Comments On Jul 10, 2017:I run two woodturning companies. YaleBowls.com and CambridgeBowl.com and I run two pens lathes simultaneously in order to turn pens as fast as I can to keep up with demands. I've turned probably 500 pens on my current two apprentice mandrels. 0 problems whatso ever. They thread very well, are true center and work well with all the bushings. Comments On Feb 19, 2016:Awesome! Makes turning pens so much easier. can't imagine turning without it. Comments On Apr 19, 2015:Great mandrel at a great price! Works great! Comments On Feb 19, 2015:I have 2 mandrels and I use the Apprentice mandrel more than the other one. Real easy to use. Love it. Comments On Jan 12, 2015:Durable mandrel and easy to use. The price is great and worth it. Comments On Dec 19, 2014:I've been using an adjustable mandrel for a while and have found that results were always "lobed" just a hair. This mandrel arrived yesterday and I put it to work in the evening. The pen parts I turned were all perfectly centered and the pen went together perfectly ! Fantastic product! Comments On Dec 22, 2014:I've only used a couple mandrels. This one works fine - no complaints. Comments On Dec 13, 2014:I love this mandrel. Very easy to use. Comments On Dec 12, 2014:I really this this pen mandrel. Easy to set up and take apart. It works better, I think, with a 60 degree live chuck. Comments On Sep 27, 2014:In using this mandrel I have found that it is fairly durable for what it is. I enjoy the use I have received out of it and the longevity for the length in time it last. overall I give this a good rating. Comments On Sep 04, 2014:This pen mandrel makes turning pens very easy. It is at a low cost but a good quality. The only thing I would like is to see some spacers available for purchase because smaller project don't use the full length of the mandrel and have to use some of your own wood as a spacer. Comments On May 29, 2014:I had never turned a pen before buying this mandrel and a pen kit but that first pen I made was super easy. The mandrels is easy to load and tighten. I have done everything from turning to sanding to finishing on the mandrel and it works great for everything! I would definitely buy it again. Comments On Sep 20, 2013:good product.